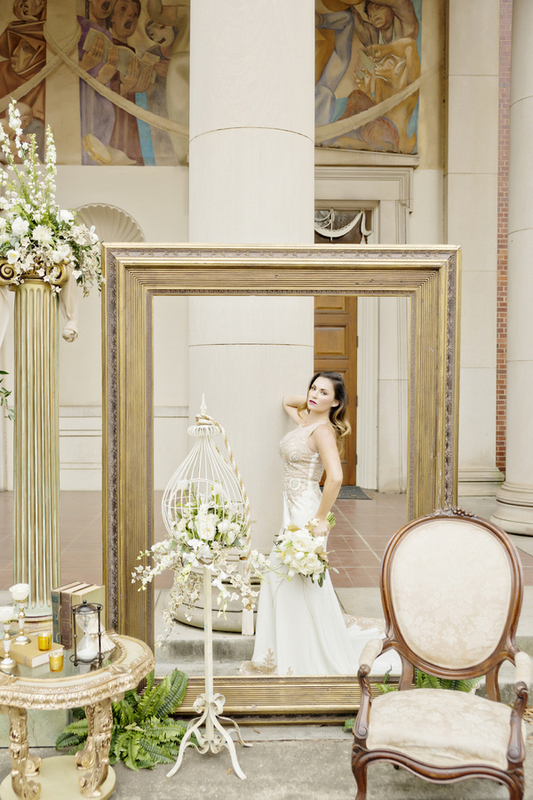 Photographer Andie Freeman drew inspiration for this shoot from two places. 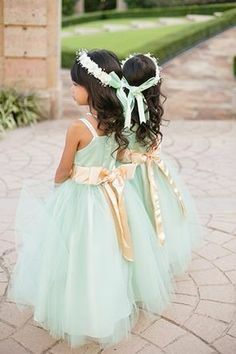 The first was the dress. 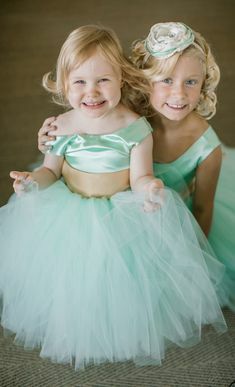 A beautiful dress designed by Shail K. A stretch premium polyester fabric compose the bottom portion and the bodice is made of illusion fabric adorned with lace appliques. It showcases an illusion neckline. Dramatic hand sewn bead work dazzles on the bodice and hemline and looks amazing in pictures. 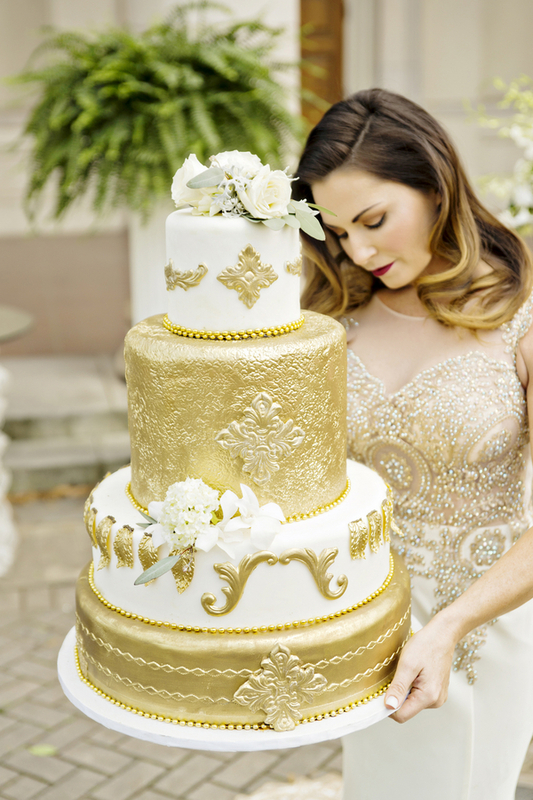 The bride wore gold glittering platform pumps to match. 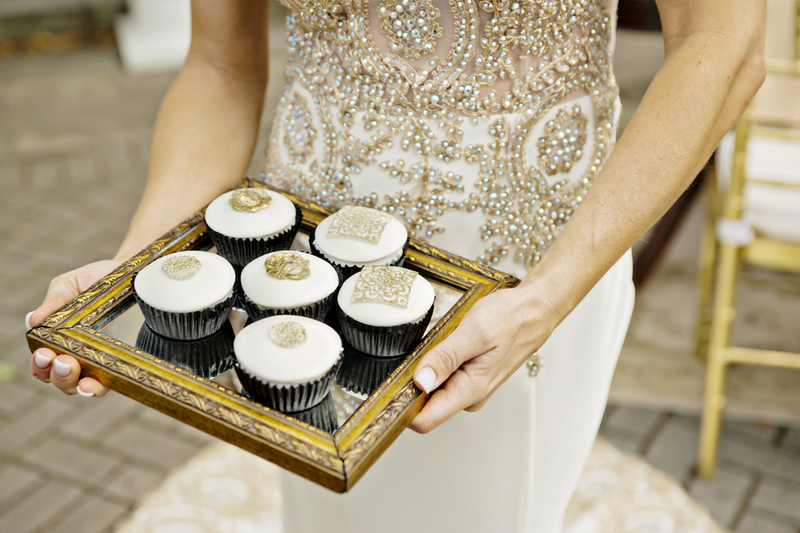 The dress has a moderate train with strategic stonework appliques to match the bodice. Andie Freeman shares more details from the shoot below. The second source of inspiration was from the city in which we live and work, Athens, Georgia. 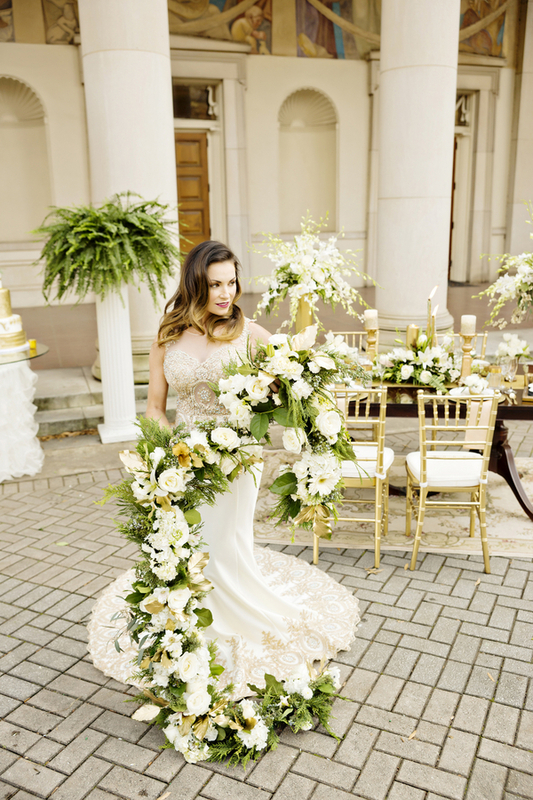 So we took a golden dress and designed a golden, Grecian wedding inspiration around it complete with a golden Grecian Goddess. 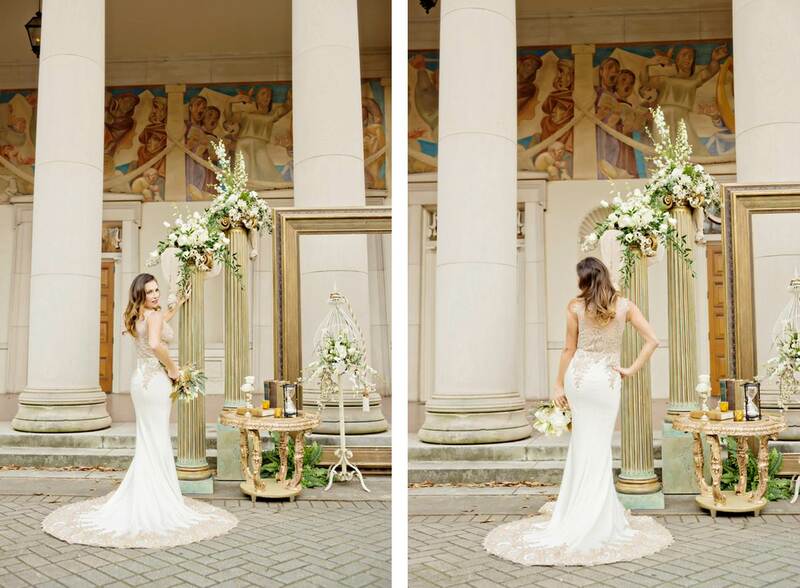 This is the Classic City, and the setting for the shoot, the University of Georgia, truly embodies that feel, from the pillars of the Drama Department building to the painting on the wall. 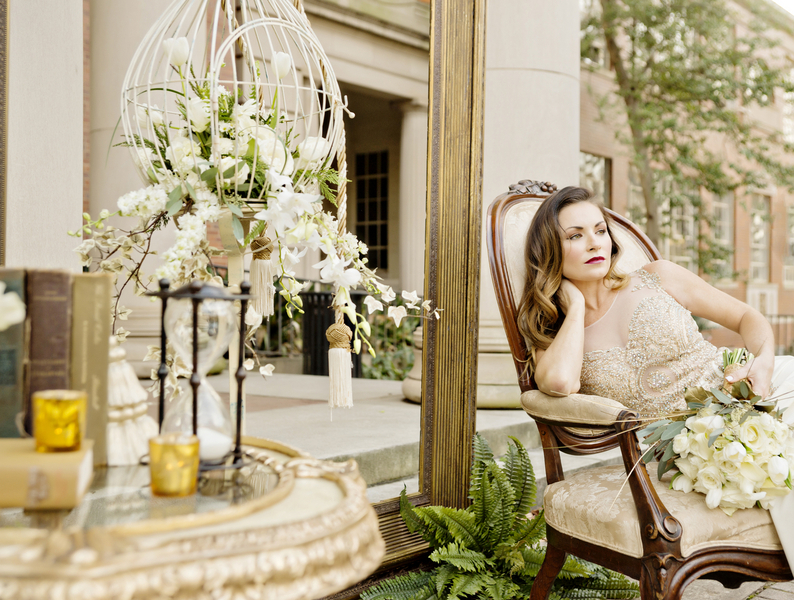 Event Designer, Greg Hall and Company, put together some amazing inspiration pieces. 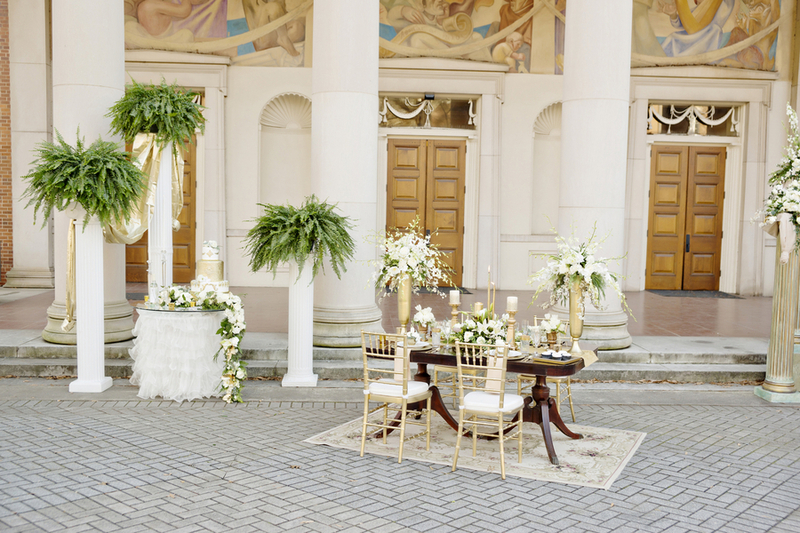 The reception inspiration consisted of an antique hardwood table with a place setting for four guests. 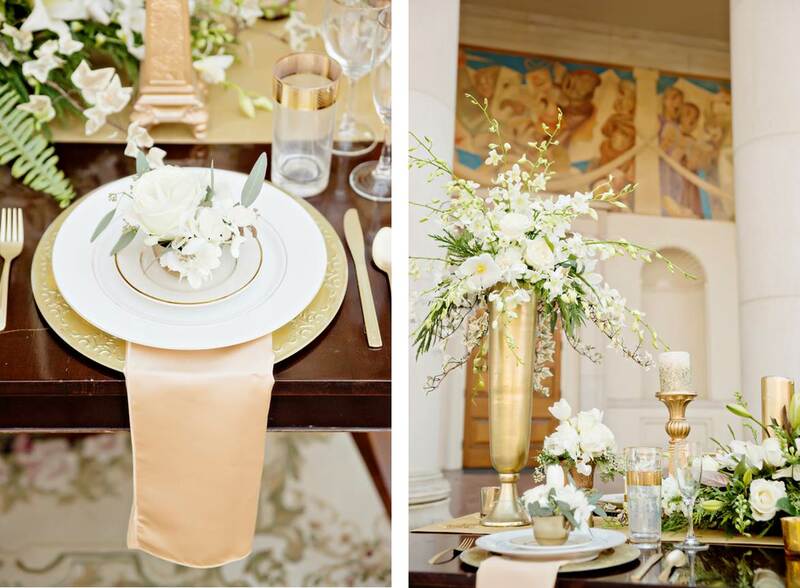 Each end of the table featured tall gold vases with arrangements including white roses and lilies. 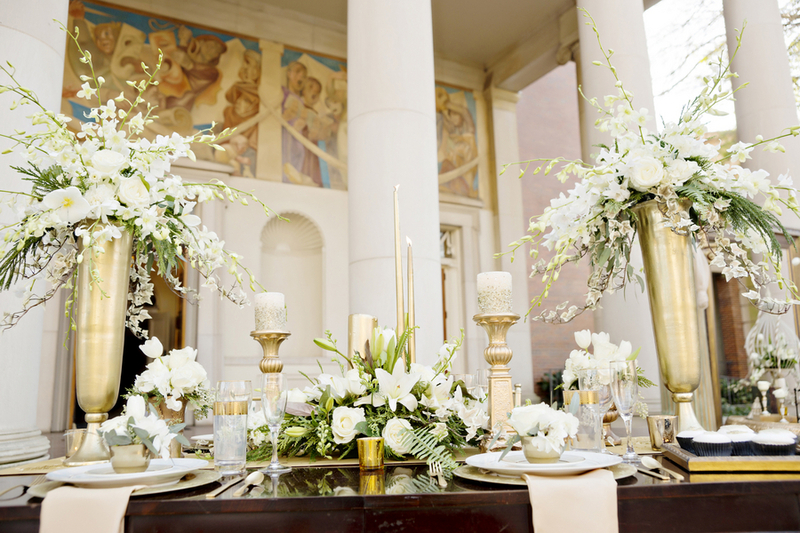 The center of the table was a smaller arrangement featuring white roses and lilies with two tall gold taper candles. 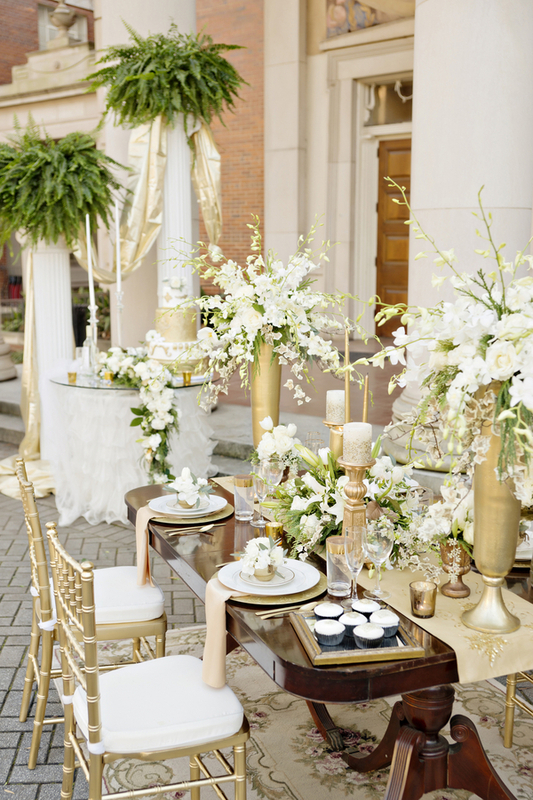 On either side of the centerpiece were two tall, gold pillar candle holders with gold beaded candles. 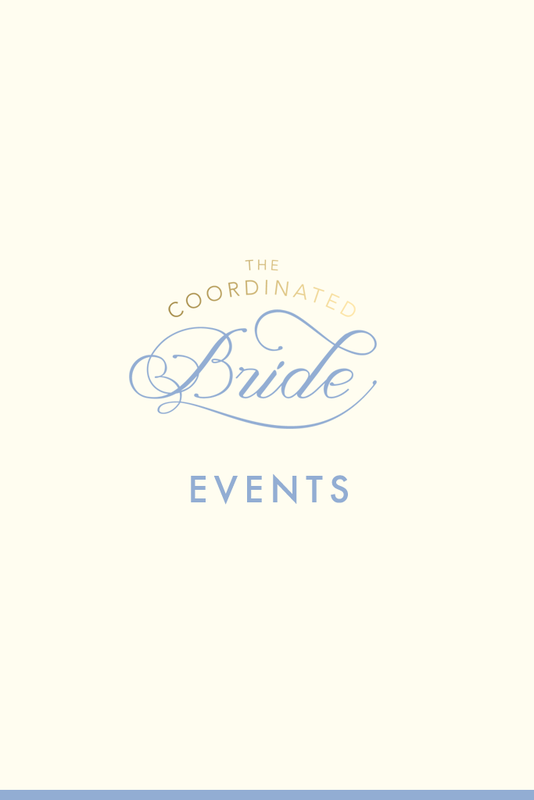 Underneath was a gold table runner with star appliques at either end. 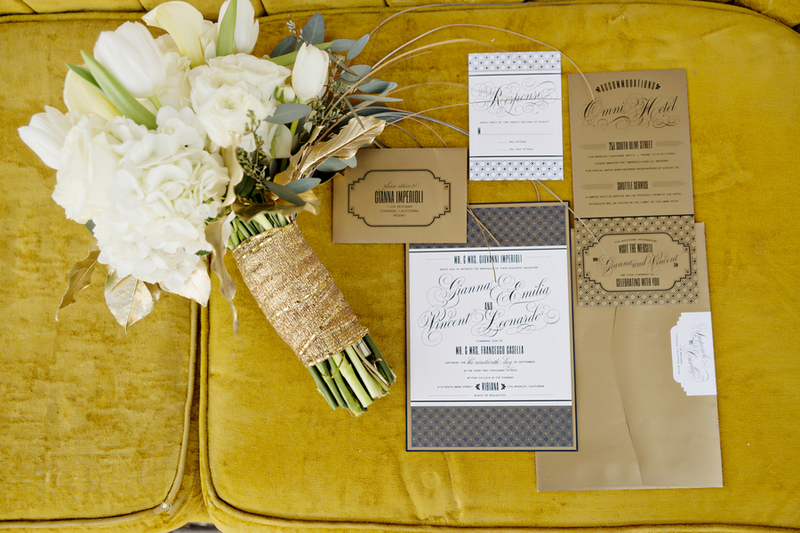 Each place setting consisted of a gold charger with a gold napkin. The china was an elegant white with a gold rim. 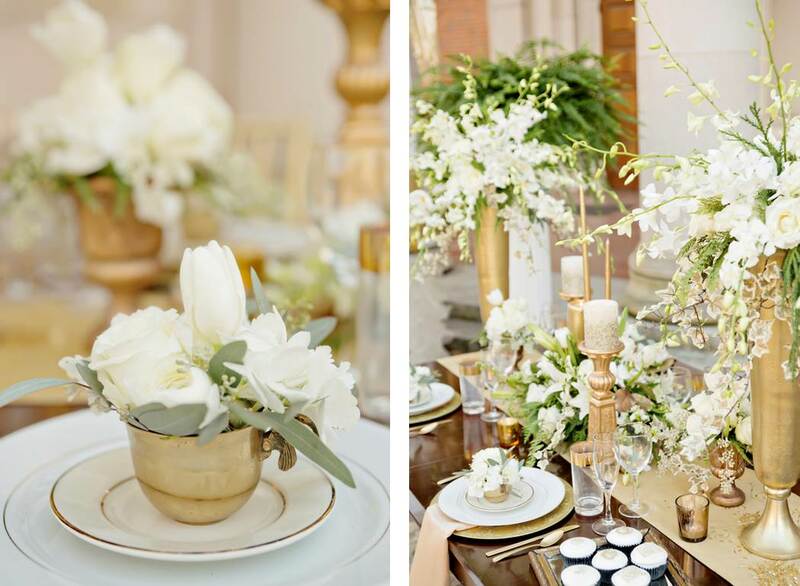 Each place setting was adorned with it’s own floral arrangement in gold vases of white roses and greenery. 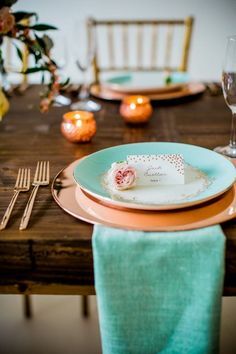 The tableware was even gold! 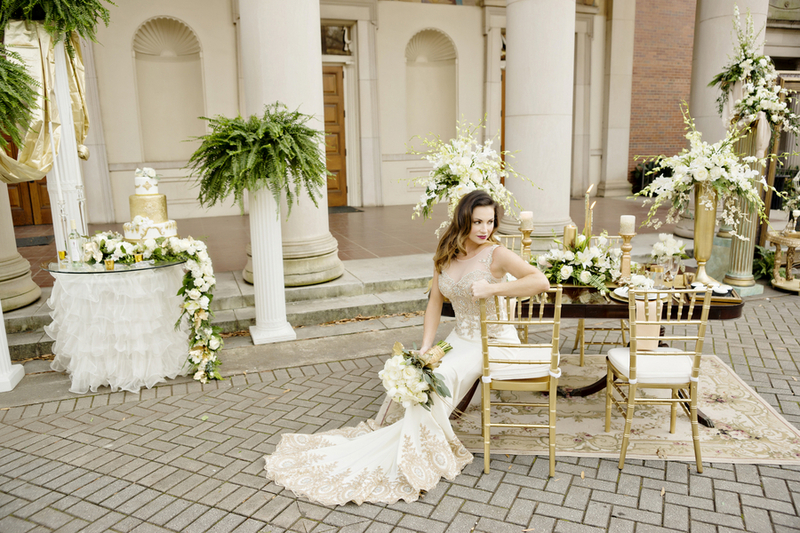 And of course there were gold chiavari chairs. 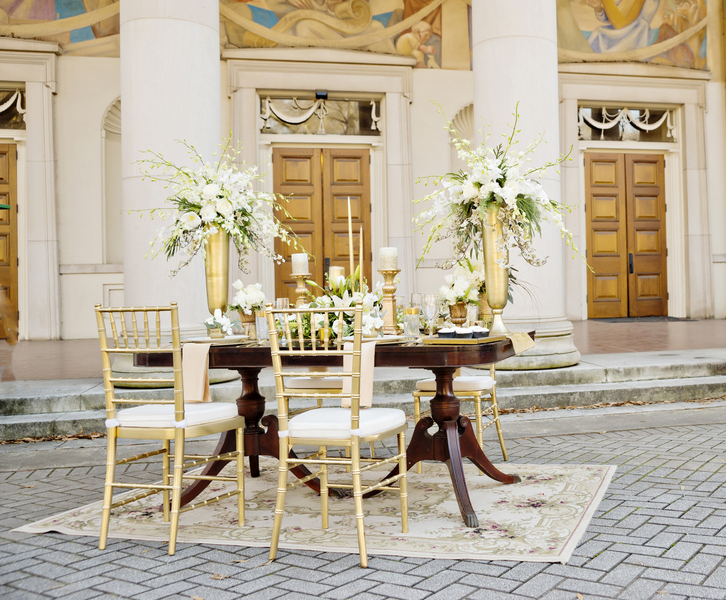 Underneath the table, was a cozy rug to make your guests feel comfortable and luxurious! 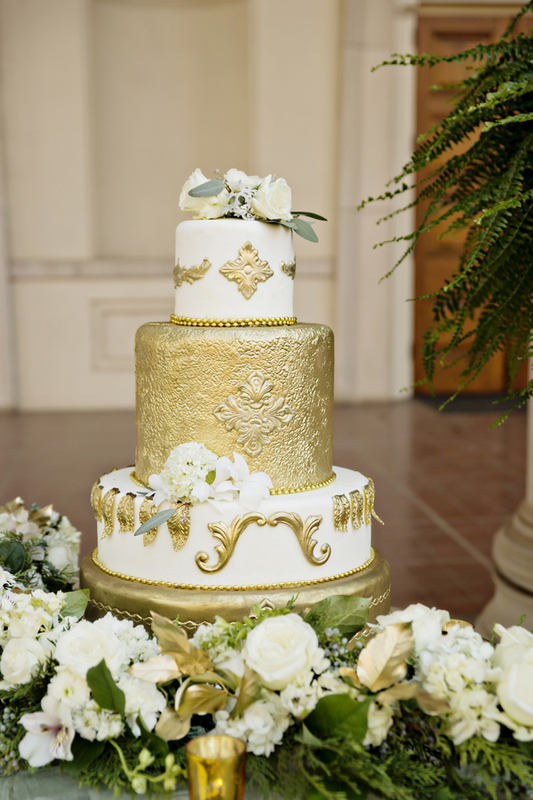 The cake was four tiered and adorned with golden accents. 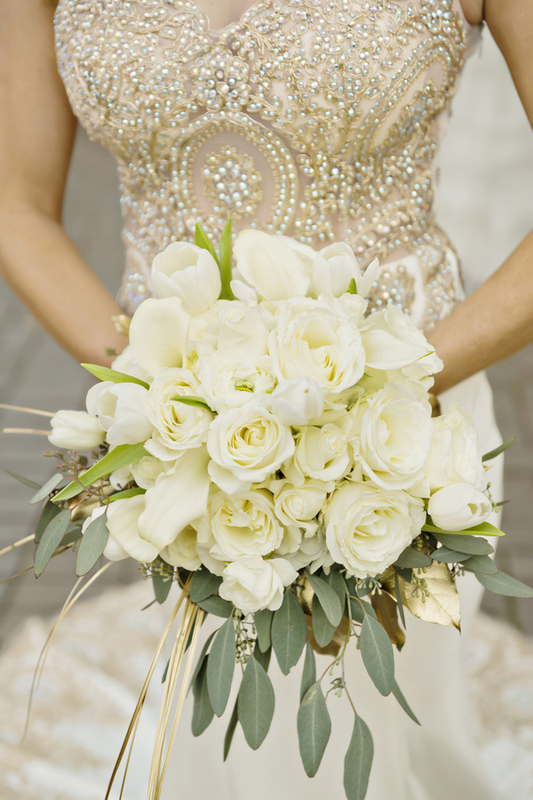 As a topper, it featured white roses. 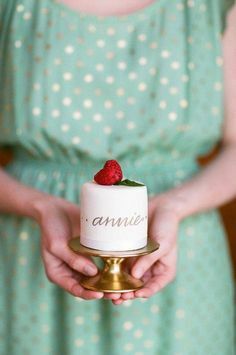 On the cake table were very tall white taper candles and a fresh rose and lily garland that was to die for! 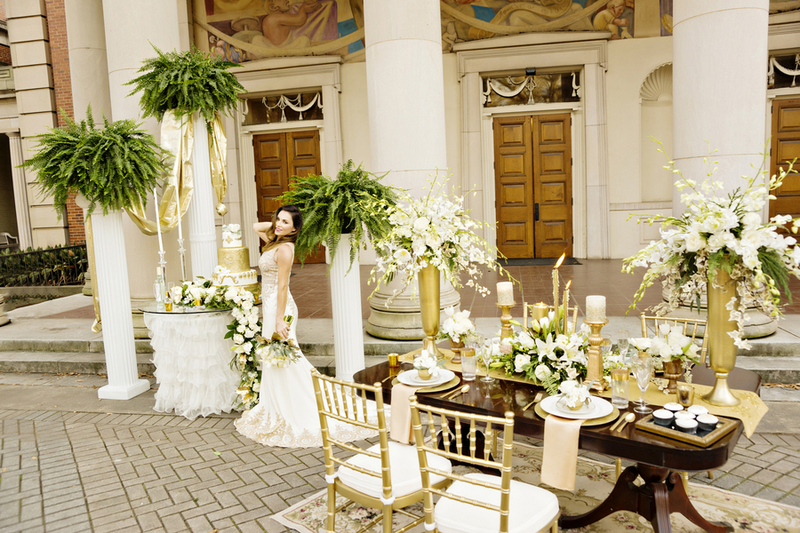 Flanking the cake table were Grecian columns draped in gold fabric and topped with ferns. 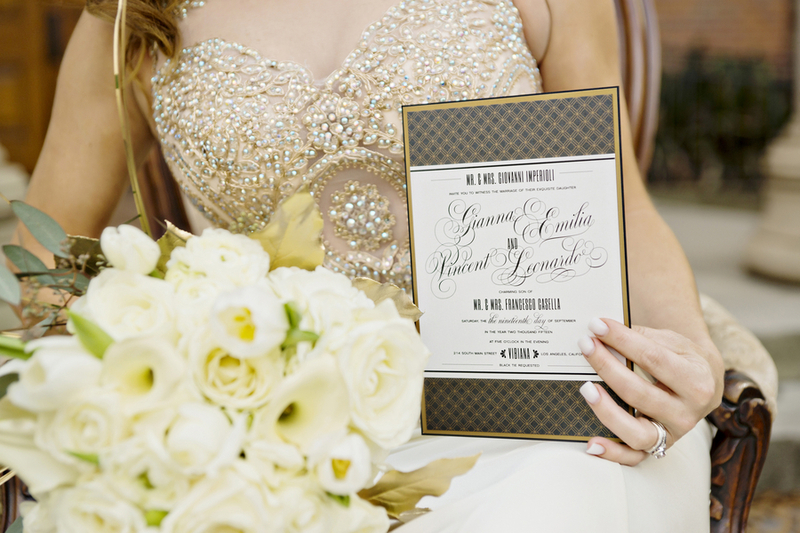 Our second seating area was just lovely, an 8 foot gold picture frame could serve as a great photo booth for guests! 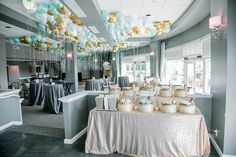 It was also flanked by columns draped in gold fabric and topped off with white rose and lily arrangements to match the reception table arrangements. 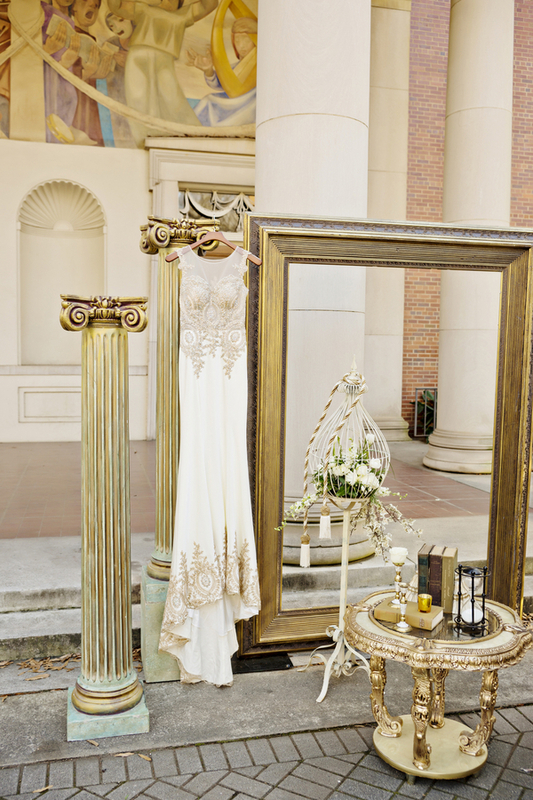 An antique table sported a stack of antique books along with an hourglass. And next to that stood a white birdcage with an arrangement of white lilies and roses inside.